Casey Trees will plant over 350 trees at 22 locations spread across all eight Wards this fall as part of our Community Tree Planting program. Each planted tree will help the District meet its Urban Tree Canopy (UTC) Goal of 40 percent, or 216,300 new trees, by 2035. That is a lot of trees. Established in 2005, the CTP program provides tools, trees, and technical assistance to individuals and groups interested in adding trees - 10 or more - to apartment complexes, synagogues, churches, parks, and even private yards located in the District free of charge. Schools are eligible to request fewer trees. 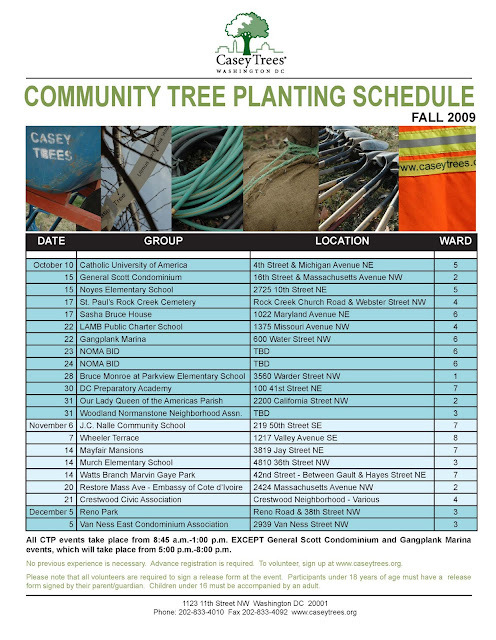 The fall CTP schedule represents the most diverse collection of planting locations to date and includes a marina, cemetery, short-term shelter for young people, embassy, Fort Circle park, affordable apartment complex, traffic circle, university and five elementary schools. We are going to be busy and seeing all different parts of the City. These trees are not going to plant themselves so we need your help. Sign up today and bring a friend. By introducing new folks to Casey Trees your are helping us to expand awareness about the important role trees play in making the District a more livable city. Also think about submitting a CTP application. Requests received before November 30, 2009 are eligible for a spring (March - May) tree planting. Click here to register and see you and soon.